Monday Morning Update: X-Men: Apocalypse led all films in new Facebook likes over the past week with 136,700, bringing its overall tally to 13,386,077 likes. It continues to post strong numbers way in advance of its full advertising pre-release barrage which is a very strong sign, especially since its routinely surpassing its predecessor Days Of Future Past. 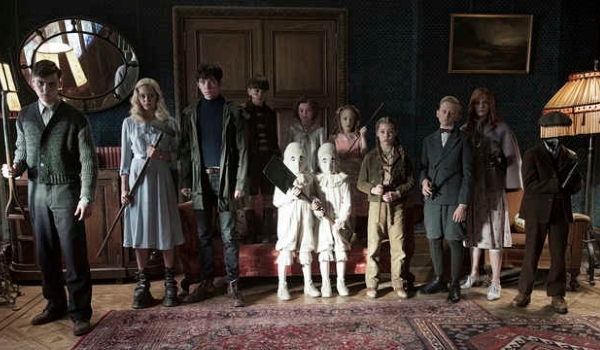 Miss Peregrine's Home For Peculiar Children showcased its first trailer last week which gave it a huge bump of 123,986 new likes. Considering that it came into the week with a scant ~25k likes this was a significant injection of interest which would have no doubt put it on the radar for many fantasy fans. By comparison, after its first trailer Fantastic Beasts And Where To Find Them rose a similar 129k new likes in December. That's some fine company Miss Peregrine is keeping there. Warcraft crept up into the top 5 for the first time. There are a lot of hopes being pinned on the adaptation with more than its fair share of nay-sayers doubting both how faithful of an adaptation of the rich source material it will be and if it will manage to be the first video-game adaptation to be seen in a favorable light by critics. Early word from social media has been positive and while its overall reception has been relatively muted outside of the massive Warcraft fanbase its sentiment scores on Twitter and overall like numbers on Facebook are encouraging to say the least on all fronts. Disney's Zootopia took in $37.16 million this weekend to lead the weekend box office for a third consecutive frame. The blockbuster 3D computer animated film from Walt Disney Animation Studios held up especially well, as it was only down 28 percent from last weekend's already strong hold. Without adjusting for ticket price inflation, Zootopia registered the ninth largest third weekend gross of all-time and the second largest third weekend gross ever for an animated film (behind only the $37.93 million third weekend take of 2004's Shrek 2). Zootopia passed the $200 million mark this weekend and has grossed a terrific $200.93 million in 17 days. The film is currently running 48 percent ahead of the $135.75 million 17-day take of 2014's Big Hero 6 and is already approaching the $222.53 million final domestic gross of that film. Thanks to its exceptional holding power thus far, Zootopia is now running just 18 percent behind the $245.89 million 17-day take of last year's Inside Out. Given its strong word of mouth, the approaching Easter holiday and the relative lack of competition for family audiences it will face throughout the rest of March and early April, Zootopia should continue to hold up very well going forward. The news was far less encouraging for Lionsgate's The Divergent Series: Allegiant this weekend. The third installment of the young adult franchise starring Shailene Woodley debuted in second place with $29.03 million. Allegiant opened a bit below its already scaled back expectations. The film had been expected to fall off sharply from the performance of last year's Insurgent and it did, as Allegiant opened 44.5 percent below the $52.26 million debut of Insurgent. Allegiant opened much more in line with the $30.32 million start of last year's Maze Runner: The Scorch Trials. Young adult adaptations have clearly seen a decline in their popularity in recent years, with Allegiant serving as the most recent example of that trend. The Divergent Series: Allegiant started out with $11.94 million on Friday (which included an estimated $2.35 million from Thursday evening shows), fell 10 percent on Saturday to take in $10.70 million and declined 40 percent on Sunday to gross $6.39 million. That placed the film's opening weekend to Friday ratio at 2.43 to 1. Allegiant received a modest B rating on CinemaScore. That isn't a good sign for the film going forward, especially since Divergent and Insurgent received respective A and A- ratings on CinemaScore. Allegiant currently has a Flixster audience score of just 49 percent, which also represents a new low for the franchise. On top of softer early word of mouth, Allegiant will also have to deal with the highly anticipated launch of Warner's Batman v Superman: Dawn of Justice next weekend. Sony's Miracles from Heaven debuted in third place this weekend with $14.81 million. After a modest midweek start on Wednesday and Thursday, the faith-based film starring Jennifer Garner really picked up the pace once the weekend hit and has grossed $18.37 million in its first five days. That gave Miracles from Heaven a five-day to three-day weekend ratio of just 1.24 to 1. The film's back-loaded start suggests that strong early word of mouth is already kicking in (Miracles from Heaven received an A+ rating on CinemaScore and has a current Flixster audience score of 85 percent). Miracles from Heaven did open 38 percent below the $29.56 million five-day start of 2014's Heaven is for Real, but wasn't expected to open as strong as that film did. It's also very possible that Miracles from Heaven will hold up better going forward than Heaven is for Real did, given its strong early word of mouth, its early back-loading and from opening one week earlier in relation to Easter than Heaven is for Real did. Miracles from Heaven was off to a nice start with its production cost in mind, as the film carries a modest reported production budget of $13 million. Paramount's 10 Cloverfield Lane was down two spots from last weekend to place in fourth with $12.51 million. The J.J. Abrams produced thriller starring Mary Elizabeth Winstead and John Goodman was down 49 percent from last weekend. That represented a respectable second weekend hold, especially since 10 Cloverfield Lane lost IMAX screens to Allegiant this weekend. In addition to good word of mouth, 10 Cloverfield Lane likely also got a bit of a boost this weekend from moviegoers who wanted to catch the film before the arrival of Batman v Superman next weekend. 10 Cloverfield Lane has grossed $45.18 million in ten days. That is towards the higher end of expectations and places the film 6 percent ahead of the $42.56 million ten-day take of last year's The Visit (which fell 54.5 percent in its second weekend to gross $11.57 million). Deadpool rounded out the weekend's top five with $8.01 million. The Ryan Reynolds led blockbuster antihero film from Fox continued to hold up nicely this weekend, as it was down 27 percent. Deadpool continues to pad its total as the highest grossing release of 2016 thus far with a massive 38-day gross of $340.95 million. Deadpool is likely to fall off much harder next weekend with the arrival of Batman v Superman. London Has Fallen followed in sixth place with $6.85 million. The action thriller sequel from Focus and Gramercy was down a very solid 37 percent from last weekend. London Has Fallen passed the $50 million mark this weekend and has grossed $50.04 million in 17 days. That is in line with expectations, but is 30 percent softer than the $71.24 million 17-day gross of 2013's Olympus Has Fallen. Los Angeles & Sacramento, Calif. - 21 March 2016 - AEG, one of the world's largest sports and entertainment presenters, and Regal, operators of the largest and most geographically diverse theater circuit in the United States, have partnered with leading global technology company Barco to announce a multi-year, strategic partnership to create Regal L.A. LIVE: A Barco Innovation Center. The current Regal Cinemas L.A. LIVE, owned by AEG, will transform into a one-of-a kind creative hub for all of Barco's cutting-edge cinema technology. The deal also marks the first and only naming rights partnership for an entire movie theater complex. "Regal L.A. LIVE: A Barco Innovation Center represents a new step in the movie theater industry for business and technology," said Shelby Russell, Vice President, AEG & L.A. LIVE Marketing. "Together with Barco, we will be continually committed to bringing audiences at L.A. LIVE the best theater experience they can find anywhere." "Regal Cinemas L.A. LIVE hosts over 20 movie premieres annually and, since opening in 2009, has provided the public with one of the best movie-going experiences possible," said Greg Dunn, President and Chief Operating Officer for Regal. "We are taking the next step in the movie theater's illustrious history by installing all the latest Barco technology, yet again setting a new standard in cinema quality." •	Barco Lobby Experience: Numerous digital displays, lights and other innovative technology will be installed throughout the lobby and concourse area, captivating moviegoers with the cinematic experience from the moment they step through the doors using light, sound and interactive content. •	Barco Laser: Initially, two theater screens in the complex will be illuminated with Barco's latest Flagship Laser projector, offering game-changing image quality with unprecedented brightness levels, increased contrast ratio, and vivid colors. All other cinema screens in the complex will be fitted with Barco Laser Phosphor projectors, turning Regal L.A. LIVE into the first all-laser multiplex on the U.S. West Coast, later this year. •	Barco Escape: One auditorium will feature Barco Escape, the three-screen, panoramic movie format that offers the ultimate immersive cinema experience. Barco Escape debuted to the public with scenes in both The Maze Runner and Maze Runner: The Scorch Trials. Additionally, director Scott Waugh (Act of Valor and Need for Speed) is currently in preproduction on the first feature length Barco Escape film and is tentatively scheduled for a late 2016 release. •	Immersive Sound: Multiple auditoriums will include the most advanced immersive sound technology from Barco and Auro technologies, featuring a new way of delivering audio that completely surrounds the moviegoer, generating the most natural and life-like audio experience imaginable. "CinemaBarco is helping exhibitors around the world to offer differentiating, premium movie experiences to their audiences," says Wim Buyens, Senior Vice President for Barco. "Through our partnership with AEG, we now have the opportunity to showcase all of these great experiences under one roof, bringing an unprecedented cinematic experience to thousands and thousands of moviegoers in the film capital of the world." Regal L.A. LIVE: A Barco Innovation Center will kick-off its public opening with a launch party celebration on April 1st from 6 p.m. to 10 p.m. with a block-party style event on the streets located in front of the theater at L.A. LIVE, the downtown entertainment district. Guests will be treated to a live DJ, street performers, local artists, and more. Moviegoers purchasing tickets for movies starting at 6 p.m. or later on April 1st, will receive a voucher for a free small popcorn and small fountain drink. To learn more about the block party and Regal L.A. LIVE: A Barco Innovation Center, please visit lalive.com/barco. 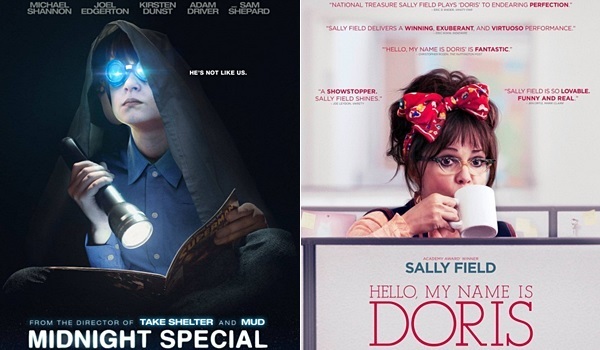 Warner's Midnight Special was off to a healthy platform start this weekend with an estimated $185,000 from 5 locations in New York, Los Angeles and Austin. That gave the Jeff Nichols directed sci-fi film starring Michael Shannon a per-location average of $37,000 for the frame. Midnight Special opened significantly stronger than the platform launch of 2011's Take Shelter, which opened with $52,041 from 3 locations (for a per-location average of $17,347). Take Shelter went on to gross $1.73 million during its domestic run. Midnight Special has received very good critical reviews, as the film currently boasts an 86 percent Tomatometer on Rotten Tomatoes. The film is scheduled to expand into additional locations on April 1. Roadside's Hello, My Name Is Doris expanded nicely into limited release this weekend with an estimated $1.01 million from 128 locations. That gave the Sally Field led comedy a per-location average of $7,906 for the frame. Hello, My Name Is Doris was up 1,091 percent over last weekend, when the film was playing in just 4 locations. The ten-day platform total for Hello, My Name Is Doris stands at $1.13 million. Kapoor & Sons - Since 1921 performed similarly in limited release with an estimated $965,000 from 143 locations. That gave the Hindi-language romantic comedy from Fox International Productions a per-location average of $6,748. Kapoor & Sons - Since 1921 was off to a stronger start than the recent $626,528 launch of FIP's Neerja (though Kapoor & Sons opened in nearly twice as many theatres as Neerja did). In its second weekend of platform release, Bleecker Street's Eye in the Sky took in an estimated $427,000 from 35 locations, for a per-location average of $12,200. The critically acclaimed film starring Helen Mirren and the late Alan Rickman was up 275 percent over last weekend, when the film was playing in just 5 locations. Eye in the Sky has grossed $579,000 in ten days of platform release. The film is scheduled to go into wide release on April 1. Upon receiving a major expansion this weekend, Paramount's Anomalisa took in an estimated $740,000 from 573 locations, for a per-location average of $1,291. This weekend represented the widest location count to date for the stop motion animated film directed by Charlie Kaufman and Duke Johnson. Anomalisa has grossed $3.42 million through 82 days of platform release. Sony Pictures Classics' The Lady in the Van continued to hold up well with an estimated $429,948 from 301 locations, for a per-location average of $1,428. The Nicholas Hytner directed film starring Maggie Smith was down just 25 percent upon playing in 62 fewer locations this weekend. The Lady in the Van has grossed a very solid $8.77 million in 66 days (and an additional one-week Oscar qualifying run back in early December) and remains on course to pass the $10 million mark before the end of its run. City of Gold took in an estimated $66,500 from 14 locations, for a per-location average of $4,750. The documentary from IFC Films' Sundance Selects label, featuring food critic Jonathan Gold was up a slim 6 percent over last weekend upon expanding into 10 additional locations. City of Gold has grossed $156,500 in ten days and will expand into additional locations next weekend. Sunday Update: Disney's Zootopia took in an estimated $38.04 million this weekend to lead the weekend box office for a third consecutive frame. The blockbuster 3D computer animated film from Walt Disney Animation Studios held up especially well, as it was only down 26 percent from last weekend's already strong hold. Without adjusting for ticket price inflation, Zootopia registered the eighth largest third weekend gross of all-time and the largest third weekend gross ever for an animated film (the previous third weekend high-mark for an animated film being the $37.93 million take of 2004's Shrek 2). Zootopia passed the $200 million mark this weekend and has grossed a terrific $201.81 million in 17 days. The film is currently running 49 percent ahead of the $135.75 million 17-day take of 2014's Big Hero 6 and is already approaching the $222.53 million final domestic gross of that film. Thanks to its exceptional holding power thus far, Zootopia is now running just 18 percent behind the $245.89 million 17-day take of last year's Inside Out. Given its strong word of mouth, the approaching Easter holiday and the relative lack of competition for family audiences it will face throughout the rest of March and early April, Zootopia should continue to hold up very well going forward. The news was far less encouraging for Lionsgate's The Divergent Series: Allegiant this weekend. The third installment of the young adult franchise starring Shailene Woodley debuted in second place with an estimated $29.05 million. Allegiant opened a bit below its already scaled back expectations. The film had been expected to fall off sharply from the performance of last year's Insurgent and it did, as Allegiant opened 44 percent below the $52.26 million debut of Insurgent. Allegiant opened much more in line with the $30.32 million start of last year's Maze Runner: The Scorch Trials. 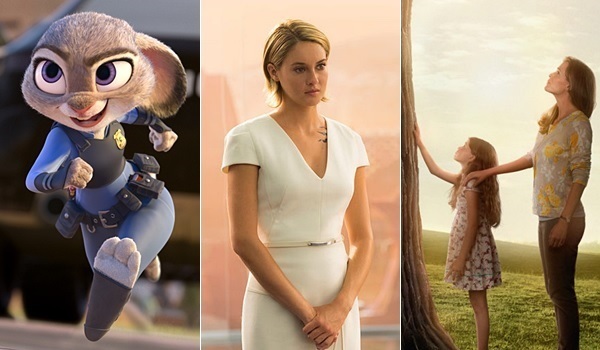 Young adult adaptations have clearly seen a decline in their popularity in recent years, with Allegiant serving as the most recent example of that trend. The Divergent Series: Allegiant started out with $11.92 million on Friday (which included an estimated $2.35 million from Thursday evening shows), fell 10 percent on Saturday to take in $10.70 million and is estimated to decline 40 percent on Sunday to gross $6.43 million. That places the film's estimated opening weekend to Friday ratio at 2.44 to 1. Allegiant received a modest B rating on CinemaScore. That isn't a good sign for the film going forward, especially since Divergent and Insurgent received respective A and A- ratings on CinemaScore. Allegiant currently has a Flixster audience score of just 50 percent, which also represents a new low for the franchise. On top of softer early word of mouth, Allegiant will also have to deal with the highly anticipated launch of Warner's Batman v Superman: Dawn of Justice next weekend. Sony's Miracles from Heaven debuted in third place this weekend with an estimated $15.0 million. After a modest midweek start on Wednesday and Thursday, the faith-based film starring Jennifer Garner really picked up the pace once the weekend hit and has grossed $18.56 million in its first five days. That gave Miracles from Heaven an estimated five-day to three-day weekend ratio of just 1.24 to 1. The film's back-loaded start suggests that strong early word of mouth is already kicking in (Miracles from Heaven received an A+ rating on CinemaScore and has a current Flixster audience score of 84 percent). Miracles from Heaven did open 37 percent below the $29.56 million five-day start of 2014's Heaven is for Real, but wasn't expected to open as strong as that film did. It's also very possible that Miracles from Heaven will hold up better going forward than Heaven is for Real did, given its strong early word of mouth, its early back-loading and from opening one week earlier in relation to Easter than Heaven is for Real did. Miracles from Heaven was off to a nice start with its production cost in mind, as the film carries a modest reported production budget of $13 million. Paramount's 10 Cloverfield Lane was down two spots from last weekend to place in fourth with an estimated $12.5 million. The J.J. Abrams produced thriller starring Mary Elizabeth Winstead and John Goodman was down 49 percent from last weekend. That represented a respectable second weekend hold, especially since 10 Cloverfield Lane lost IMAX screens to Allegiant this weekend. In addition to good word of mouth, 10 Cloverfield Lane likely also got a bit of a boost this weekend from moviegoers who wanted to catch the film before the arrival of Batman v Superman next weekend. 10 Cloverfield Lane has grossed $45.18 million in ten days. That is towards the higher end of expectations and places the film 6 percent ahead of the $42.56 million ten-day take of last year's The Visit (which fell 54.5 percent in its second weekend to gross $11.57 million). Deadpool rounded out the weekend's top five with an estimated $8.0 million. The Ryan Reynolds led blockbuster antihero film from Fox continued to hold up nicely this weekend, as it was down 27 percent. Deadpool continues to pad its total as the highest grossing release of 2016 thus far with a massive 38-day gross of $340.94 million. Deadpool is likely to fall off much harder next weekend with the arrival of Batman v Superman. London Has Fallen followed in sixth place with an estimated $6.89 million. The action thriller sequel from Focus and Gramercy was down a very solid 36 percent from last weekend. London Has Fallen is estimated to pass the $50 million mark today and has grossed $50.09 million in 17 days. That is in line with expectations, but is 30 percent softer than the $71.24 million 17-day gross of 2013's Olympus Has Fallen. Saturday Update: The Divergent Series: Allegiant took first place on Friday with an opening day of $11.9 million, although that figure comes in 44 percent lower than Insurgent's $21.15 million opening day last year. With poor reviews and modest word of mouth, unfortunately the penultimate chapter of the series is indicative of some burnout among fans of the property and the young adult sub-genre itself. BoxOffice projects a $29 million opening weekend in second place. Slipping to second place briefly yesterday was Zootopia, which was off just 20 percent from last Friday to $9.63 million. Incredible word of mouth continues to drive the latest smash hit from Disney Animation as it now stands at $173.4 million through 15 days - 44 percent ahead of the pace of Big Hero 6. BoxOffice projects an excellent $40 million third frame. Coming in third place, Miracles from Heaven added $4.15 million in its third day of release. With a $7.7 million three-day start, the faith-based film is off to a fair start but hopes to enjoy a leggy run thanks to positive word of mouth among target audiences as we get closer to Good Friday and Easter Sunday. BoxOffice projects a $12.3 million three-day weekend for an overall five-start of $15.9 million. In fourth place, 10 Cloverfield Lane eased 59 percent from opening day last Friday to $3.665 million yesterday. The strongly received thriller has taken in $36.34 million through eight days of play, 67.5 percent more than The Cabin in the Woods at the same point. Look for a sophomore frame around $11.7 million. Filling out the top five, Deadpool added $2.25 million yesterday to bump its domestic take up to $335.2 million. This weekend should take in $8.1 million. Meanwhile, Jeff Nichols' Midnight Special got off to an excellent start in its five-theater launch yesterday with $61,000. With a strong per-theater average of $12,245, the well-reviewed film marks another successful chapter in the filmmaker's burgeoning career. We project a weekend around $190,000. Friday Update: Sources report that The Divergent Series: Allegiant rang up $2.35 million in early shows last night, marking a sharp 43 percent decline from the $4.1 million take of last year's Insurgent. Based on last night's performance, the film is an eyeing an opening day between $11-12 million and an opening weekend that could fall shy of $30 million. Meanwhile, Miracles from Heaven eased 12 percent from opening day Wednesday to $1.66 million on Thursday. With a two-day haul of $3.56 million and positive word of mouth from target audiences, Sony continues to project an $8-10 million five-day opening for their latest faith-based film. Disney's Zootopia is expected to retain first place again for a third straight weekend. Weekend estimates will follow on Saturday morning once studios report official Friday estimates.